In 2016, it's common to think about humans holistically, taking into consideration both tangible factors, such as the physical body and surrounding environment, and intangible ones, such as thoughts and emotions. 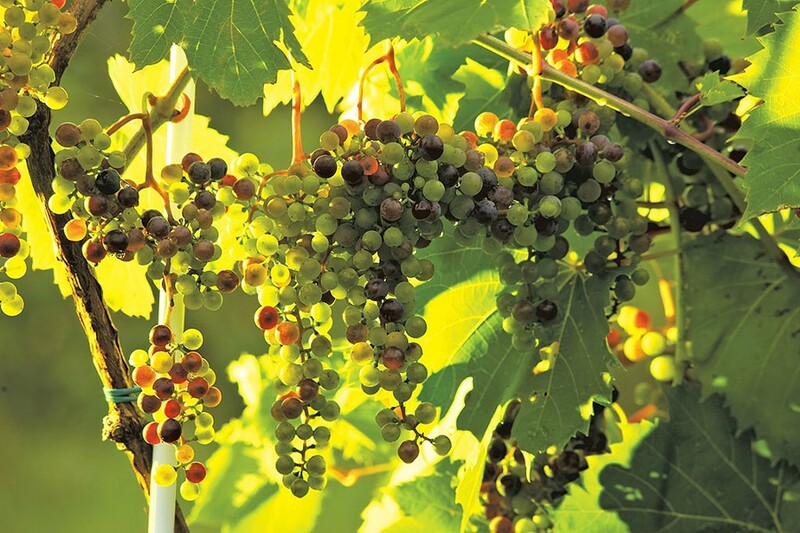 Taking a holistic view of grapes on a vine, however, may seem a bit too mystical to some. And yet, while grapes don't think or feel, they are part of a complex ecological system. That's where biodynamic winemaking comes in. The practice treats the vineyard as an ecological entity from the soil up, fertilizing plants and managing pests with environmentally balanced interactions rather than chemicals. From vine to vat, biodynamic wine is made without chemical sprays or additives. Deirdre Heekin, who co-owns the Barnard-based biodynamic farm and winery La Garagista with her husband, Caleb Barber, is a well-known advocate of natural wine growing — a movement that counters the common practices of industrial viticulture. Heekin's vineyard was the first of its kind in the markedly unfriendly grape-growing climate of Vermont. In 2007, she and Barber packed a truck with fledgling vines from the former nursery at Lincoln Peak Vineyard in Middlebury and, said Heekin, "went down the rabbit hole." Heekin also guides neophyte natural winemakers. With her help, Paul Gibson — a Shelburne local and affiliate of Dedalus Wine in Burlington — has joined the fray. Two years ago, Gibson and his wife, Allison, a manager at Hen of the Wood and Doc Ponds, discovered .75 acres of overgrown vines on the edge of Shelburne Vineyard. Some plants had died from disuse, but the remaining clusters of still-trellised grapes offered a few pounds of fruit that Heekin, just for fun, pressed into a bottle of rosé Pét-Nat. "It was a delicious field blend, and it showed the plot's potential," said Gibson on the porch at La Garagista's home vineyard. "My wife and I went out there again last summer, waist-high in the weeds, looking for stumps. We decided to lease the space from Shelburne Vineyard and grow without a spray program. 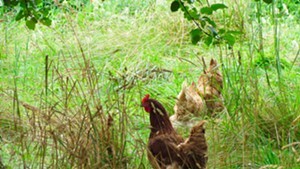 We wanted to resurrect it and convert the land to a biodynamic plot." The Gibsons will gain two more acres of vineyard in 2017 at Sanctuary Farm in Charlotte, owned by Susan Huling and Russ Blodgett. Gibson, who describes himself as science-oriented, admitted that biodynamic farming may sound to some like "a bit of witchcraft mumbo jumbo." He's talking about practices such as planting in accordance with the lunar cycles and using natural disease and pest deterrents such as plant-tea sprays, mineral sprays such as kaolin clay, and bug-repelling crops such as chrysanthemum and goldenrod. Then there's the "horn thing": The grower makes a humus mixture by filling a cow's horn with manure, burying it in the ground in the autumn and recovering it for fertilizer the following spring. Gibson likened the difference between biodynamic and conventional wine growing to that between Western and non-Western medicine: Both prove their usefulness while speaking separate languages. "I don't always understand why [you do something] in biodynamic farming," said Gibson, "but these vineyards are teeming with life. You can visit a strip of wine country, and all you see is dirt and vines. There's nothing else — it's all dead. In natural wine growing, the vines are part of the whole ecosystem; you don't just grow, you build the vineyard's immunity." And, he noted, the wines are as delicious as they are unique. Gibson is not alone in endorsing Heekin and Barber's biodynamic method. In a 2015 New York Times article on La Garagista, wine critic Eric Asimov described the couple's Vermont wines as "so soulful and delicious, they challenge crucial assumptions long taken for granted." One of those assumptions is that fragile grape plants can't survive in the absence of chemical intervention. Another is, as Gibson noted, that it's all a bunch of "mumbo jumbo." A look at the roots of biodynamic agriculture sheds light on those assumptions. Austrian philosopher and academic Rudolf Steiner codified the method in the late 1920s. While his views on ecological farming reflect age-old cultivation practices, he was the first to systematize them in an international guideline — the Demeter certification — and influenced the creation of the nonprofit Biodynamic Association, established in 1938. The late '20s were an especially ripe time for Steiner's lectures, which countered the practices of chemical spraying and fertilizing that had cropped up in Germany at the end of the 19th century. Fungicides and pesticides got another push post-World War II when chemical supplements were regarded as technological innovations. To a postwar and post-Depression population, the pros of higher production were clear. More than six decades later, it's no longer news that a chicken raised with ventilation fans, synthetic light cycles and antibiotics is bad for the eater and the environment. But, as acclaimed natural-wine proponent Alice Feiring noted, the quality of the things we imbibe hasn't yet gained the same attention. Last Wednesday, Feiring, a James Beard Award-winning wine writer for publications such as Time and the New York Times, visited La Garagista for a tour and cellar tasting. For the first time in weeks, the ground was wet from overnight rain. Beads of moisture clung to the long necks of wine bottles set in ice tubs for the day's tasting, and mosquitoes hovered over the amethyst-colored grapes hanging from their vines in the sleepy morning. Heekin led the way across the sloped vineyard, plucking leaves of piquant arugula from a raised bed and meandering around a crew of chickens that pecked beetles from the base of the grapevines. Back on the wooden porch, Feiring explained what sparked her interest in biodynamic winemakers. "I came to natural wine because it tastes better," she said. "But, as someone who tries to eat as naturally as possible, I never understood the disconnect in people who buy quality groceries, stay away from fast food and end up drinking crap." Determining what is not "crap" takes close attention and research, she added: Wines without organic and biodynamic distinctions have fewer restrictions on the additives allowed in the final product. "People are often unaware of what's in commercial wine," Gibson said, as Heekin set out long-stemmed glasses. "The list of allowed ingredients is about two pages long." These additives, marked "GRAS" (Generally Recognized as Safe) by the FDA, are not listed on the back of wine bottles. They could include foaming agents, coloring agents, acidifiers, deacidifiers, casein, pepsin, trypsin, dimethyl dicarbonate, ammonium phosphate, sodium carboxymethyl cellulose, potato protein isolate, acetaldehyde, isinglass and the dried swim bladders of fish (used for wine clarification). That list lends support to the practice of nonchemical intervention — which, it's crucial to note, does not mean the absence of intervention. Biodynamic wine growing is not about planting a cow's horn in the ground and praying to the lunar gods for a bountiful harvest; it has a specific, hands-on production method. At Vermont's biodynamic vineyards, that practice involves the systematic introduction of plants to the main crop. In a process called massal selection, cuttings from vines that exhibit the most desirable traits of adaptation and resistance are planted in raised beds for further experimentation. And since soil fertility and diversity of the vineyard's ecosystem are paramount, problems such as a leaf-munching Japanese beetle invasion require the grower to rethink the symbiosis of the entire operation, rather than grabbing a tank of pesticide spray. Critics of biodynamic wine note its comparatively high price. Yet Heekin's La Garagista label draws inspiration from an international movement built on the philosophy that quality wine is not reserved for the upper class. "The 'garagistes,' meaning makers of 'garage wine,' deem that you don't need a château, an inheritance, a ton of acres or five generations of predecessors to make good wine," Heekin explained as she poured a taste of Hunger and Love. The gold-hued wine is made from the La Crescent grapes growing outside. Savory undertones of cumin and spice balance sweeter notes of white flower and vermouth. The wine is glaringly different from the product of the La Crescent grapes from another of Heekin's vineyards, in Vergennes, where soil flush with clay and limestone makes a white almost akin to ice cider. Feiring illuminates its fantastic tartness in her tasting notes: "clover, lemon confit and Buddha's hand citron." La Crescent grapes from Heekin's third vineyard in West Addison produce a honey-colored glass lush with peony and rose petal. Those tastes may reflect the daisy fleabane, wild mint and purple asters scattered over the plot. "[These grapes] are very special voices of our land," said Heekin. "With everything — the soil, the wine, the farming — it's all about trying to find balance. Nothing will ever reach zero, but it's fun to try." Later that afternoon at La Garagista's West Addison vineyard, Barber found a nest under a canopy of vines filled with baby robins chirping drowsily. Then Feiring found a similar nest at the Vergennes vineyard, the small birds sucking down worms and bugs their mother had caught among the trellised grapes. "That's definitely a good sign," remarked Barber. "Things are thriving here." While La Garagista's grapes mature under the mid-August sun, other plant and animal life prospers in the ecosystem of the vineyard. While skeptics may consider biodynamic growing a pseudoscience, Heekin asserted, "What's going on here is biology. It's physics — it's gravity. Inoculating immunity-boosting bacteria in an animal bladder or a horn is a method of natural chemistry. Nature also makes chemical balancers, like horsetail, dandelion and quartz." Heekin recalled an incident that sold her on the biodynamic method back when she and Barber had just expanded from making wine in their bathtub. New to the practice, Heekin sprayed plant teas like horsetail and nettle on the new grapevines, having learned they were natural repellents. "A while later, I noticed a ring of powdery mildew — a fungal disease — circling the outside of the orchards," Heekin continued. "The vines, and everywhere else we sprayed, were completely untouched." A few years later, "in 2013, we had a horrible infestation of Japanese beetles," Heekin said. "They can defoliate a vineyard in no time flat." The Marquette vines were most affected, with clusters of the jewel-backed bugs eating leaves to the veins. But the following year, Heekin and Barber noticed wild chrysanthemum growing of its own accord along the Marquette area. Chrysanthemum, Heekin noted, is a natural insect repellent used in both organic and chemical Japanese beetle sprays. The wild mums reminded Heekin of the central ethos of biodynamic farming, which she expressed best: "Nature knows better than you." The original print version of this article was headlined "Vine of the Times"